Research assistant (trade and economic affairs) at the Royal Danish Embassy in Moscow, Russia. Conscript at the Danish Emergency Management Agency (DEMA) in Thisted until mid March. From mid March and onward in Næstved as a secretary and president of LTU (the board of spokespeople at DEMA). Bachelor of Science in Engineering, Industry and Export from Aalborg University with a specialization in Production and Planning Control from the Institute of Production. I have studied electronics until my 5th semester and finished the 4 first semesters at Aalborg University Esbjerg. Click to see the diploma and the diploma supplement. Russian language course at The Pushkin Institute in Moscow, Russia. Click to see the diploma. Russian language course at Moscow State University, Russia. Click to see the transcript. Secondary school at Esbjerg Statsskole with science as main subject. Been involved in the pupil council both local and regionally. 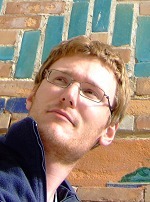 Co-founder, author and layouter of the school paper Mentalt Fravær. Click to see the diploma. Primary school at Fourfeldtskolen until 9th grade. Project management assistant, FLSmidth Rus, on a project in Slantsy, Russia. Sales manager, FLSmidth Rus, Moscow, Russia. Assistant supervisor, Cement Plant Consultants A/S on a project in Ivano-Frankivsk, Ukraine. Sales trainee, FLSmidth, Copenhagen, Denmark. BMS Engineer, Moscow office, OOO Danfoss (until 1st January 2007 ZAO Danfoss), Russia. Substitute teacher at the primary school Blåbjerggårdskolen (periodic). Student adviser at Aalborg University Esbjerg for the STORM-programme. Instructor for the new students for the study board of the basic education (engineering and science) at Aalborg University. Assistant in the grocery department in the supermarket OBS! in Esbjerg. Paper boy at Morgenavisen Jyllandsposten. Periodic work at Arnold Thomsen A/S and later Rosendahls Bogtrykkeri (printing works). Editor at Emporis.com - a site of high-rise buildings and skyscrapers. Chairman of AKU-Aalborg - the central administration of hostels and administration in Aalborg. Critical accountant of the student union (DSR-SE) at Aalborg University Esbjerg. Traineeship at Institute of Automatic Control, Silesian University of Technology in Gliwice, Poland. The training consisted of the construction and testing of computer algorithms for classification of different types of cancer. President of the student union (DSR-SE) at Aalborg University Esbjerg. Vice-president of the student union (DSR-SE) at Aalborg University Esbjerg. Webmaster at the student union (DSR-SE) at Aalborg University Esbjerg. Member of the study board for the basic education in engineering and science at Aalborg University. Before that, I was webmaster, accountant and committee member of several organizations (RAF etc.). English: Fluent, written and spoken. German: Excellent understood, fair spoken and written. Norwegian/Swedish: Excellent understood both spoken and written. Russian: Intermediate level, highest exams; Danish B-level (click to see the diploma) and Russian B1 (Threshold level) examination from Pushkin State Russian Language Institute, Moscow (click to see the certificate). B (car with a weight up to 3500 kg) and C (truck without a trailer). Software packages: Standard office applications, such as MS and OpenOffice. Graphical programs: CorelDraw and Paint Shop Pro. Operating systems: Windows systems from 3.11 to Windows XP/2000, BeOS and Linux/UNIX. Programming experience: MatLab, C and Delphi. Cycling, skating, roller-skating, hiking and cross-country skiing. History - especially cold war and present, politics, human space flight, space technology and Eastern Europe - Russia especially. Russia, Ukraine, Poland, France, Norway.